Libreville, September 21st, 2011 – Africa’s Eden announced today that it will re-open its Loango Lodge in Gabon for international guests on 15 December 2011. Africa’s Eden, which is the pioneer of safari tourism to Gabon, had suspended its operation in mid-2010 following access difficulties. These difficulties have now been resolved and reliable aviation connections have been re-established. The reopening of Africa’s Eden flagship Loango Lodge and satellite camps are accompanied by an improvement project exceeding € 1 Million which is currently in full swing. The improvements include, amongst others, a full interior refurbishment of rooms and public areas, an extension of the lodge’s runway, the increase of Loango School capacity and the creation of over 130 jobs, thus taking up its role as the area’s main employer again. Loango Lodge, its satellite camps as well as the lowland gorilla sanctuary Evengué Lodge, offer an unrivalled, exclusive nature experience. Africa’s Eden, winner of the British Guild of Travel Writers’ Award and finalist in the National Geographic Changemakers’ Tourism Challenge, expects that within 12 months the size of its operation will reach previous levels of around 10,000 bed-nights per year. Once again, passionate travellers will be able to experience the unique, diverse and intact eco-systems in and around Loango National Park. Loango National Park is one of the 13 national parks declared in 2002 by the late president Omar Bongo Ondimba. This coastline park covers some 1,550 square kilometres and is famous for its variety of unspoiled landscapes, forest elephants and buffalos, lowland gorillas and chimpanzees. Some of these can be seen from time to time –uniquely on Earth –on the Atlantic Ocean’s tropical beaches. Rombout Swanborn – owner of Africa’s Eden – said during his visit to Loango Lodge on Sunday 4 September: “We are discussing with representatives of the Gabonese government the possibility to expand our conservation activities. These possible activities include a littoral ecology research centre to be based next to Loango Lodge and the expansion of Africa’s Eden’s investments in tourism activities in Gabon by developing other lodges in the country’s National Parks. Africa’s Eden has invested over €15 million in the west central African region since its formation in 2001, contributing €3 million towards conservation and wildlife research, independently and through renowned conservation organisations and universities such as the Max Planck Institute, the California Academy of Sciences (Herpetology unit), and the Wildlife Conservation Society (WCS). The company started its operations in Loango National Park, Gabon, with the aim to develop low-impact tourism and conservation in Gabon through the concept of ‘tourism pays for conservation’. Having gained a wealth of experience in Gabon, Africa’s Eden has started to apply this concept to other countries in the region with organised tours to Gabon, São Tomé & Príncipe and the Central African Republic. The aim is to offer travellers a unique experience, while at the same time contributing to its nature conservation. 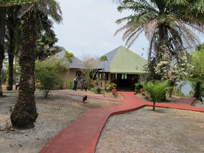 The upgrading of Loango Lodge has just started and is scheduled to take place until November 2011. The focus is on bringing Loango Lodge back to the standard of its reputation as Gabon’s premier safari lodge. The Satellite Camps Pointe St. Catherine Beach Camp and Tassi Savannah Camp will also be upgraded to fully serviced and staffed camps that invite travellers to a multi-night stay. Subsequently, also Evengué Lodge and Akaka Bush Camp will be completely revamped and launched as up-scale, intimate camps for discerning safari guests. The award winning interior lodge designer Laurie Owen has visited the lodge and camps with Rombout Swanborn in order to develop interiors and outside spaces that enhance the natural beauty of the surroundings. The airstrip at Loango Lodge is being extended to 1000m and resurfaced to allow direct flights from Libreville and Port Gentil. Due to the imminent start of the rainy season, an exact date of finishing the work on the airstrip cannot, as yet, be announced. In addition, as an important expansion of services to the local community, Africa’s Eden’s will increase the primary school capacity to 100 children and is starting professional training services. Africa’s Eden will provide employment to approximately 130 members of the local community, and will take up again its role of being the area’s main employer. The equatorial country of Gabon is straddling the equator and borders the Atlantic Ocean. Gabon is one of Africa’s least populated countries with only 1.4mln inhabitants. Approximately 80% of the population is urbanised, making the average number of persons per square kilometre in rural areas less than one. Gabon showcases that the responsible exploitation of its vast oil reserves and well managed forestry can be combined with sustainable tourism. More than 11% of Gabon’s territory is declared national park which are surrounded by conservation areas. Here you can find dense jungle, savannahs, wetlands and lagoons as well as an abundant range of animals, from the smallest of insects to lowland gorillas, chimpanzees, elephants, humpback whales, red river hogs, turtles and birds, all in their natural habitat.